Like most parents or educators we want to share and explore the world with our children, but it may not necessarily be to places that we can easily get too. Instead of getting on an airplane or driving a car, children can now take part in a virtual field trip to just about anywhere. Has your early elementary student had a chance to explore the Africa desert with virtual friends, Ansel and Clair? Around this time last year, Cognitive Kid launched Ansel and Clair’s Adventures in Africa for your iPad device but as of late has added the ability to explore and visit Africa via your iPhone device as well. We were impressed with this series then and are excited to share that a new virtual experience has been added to their collection list, Ansel and Clair Cretaceous Dinosaurs for your iPad device. This is the first in a trilogy series of Ansel and Clair Adventures which focuses on exploring different dinosaur periods: Triassic, Jurassic and Cretaceous. Come visit an official dig site, ask questions of a paleontologist as your son or daughter interacts with their mobile device. As your child or student explores the cretaceous period they will travel back in time with adorable characters and a “zippy” spaceship to broaden their knowledge and build their vocabulary while having a ton of fun! This educational app could not have come at a more appropriate time in our household. My 6 year old son had library today and what type of book did he come home with…an encyclopedia of dinosaurs. A book which has 127 pages, he worried that we might not be able to finish the book in time before having to return it to his school library. His worry was quickly put to ease when I mentioned our recent download, Ansel and Clair Cretaceous Dinosaurs to my iPad device. It is an educational app which puts your child at the center of it all. Simply borrow a fossil from Dr. Lindy Bones in order to get your spaceship moving around the world. While spinning the globe, see what the world looked like before it was broken into the continents that we know today. As your child embarks on this imaginative and educational adventure, join Ansel and Clair as they go beneath the ground to find more fossils of the cretaceous period while reinforcing various fine motor skills. Tap with one or two fingers or swipe from side to side in order to explore and play. In doing so, your child(ren) or students will feel as though they have a chisel, hammer or brush at their finger tips. Once all the tools have been used and the fossil is revealed, piece the dinosaur back together like a puzzle and see the environment where such dinosaurs as: Tyrannosaurus Rex, Velociraptor, Kosmoceratops and Oviraptor lived billions of years ago. Hold on tight, because here we go! As your child(ren) or student(s) go on this adventure they will become critical thinkers with the help of Ansel and Clair. Your elementary students earth science unit or textbook just stepped into the 21st century. Developers have included a great deal of support through both visual and verbal directions. Those items on a page which provide factual information are clearly marked with a magnifying play button or checkmark. In addition, many of the dinosaur names are challenging for our target audience or even an adult to say, so developers have also included a syllable break down just underneath each reptiles name. Since this is like no other journey, your child will be equipped with a backpack which has all the essentials, a camera and a journal. Take as many pictures as you would like, however, your journal does have certain requirements. A note to the developers – might it be possible at the completion of ones journal to be able to tap on pictures within those pages, as a way to share new information or even a recall quiz like question(s) for comprehension. Ansel and Clair do an amazing job at sharing new information and building your child’s vocabulary, the opportunities for extended conversations and further investigation are amazing. As they learn and develop their filing system of knowledge, your child will also be interacting with those from the cretaceous period as they collect stickers, see a volcano erupt, watch a meteor show and care for Maiasaura’s eggs. Overall, we loved this first in the series dinosaur application, Ansel and Clair Cretaceous Dinosaurs and look forward to learning more about the Jurassic and Triassic periods in the coming months. Whether you have a little paleontologist on your hands or need to spruce up your earth science unit, the educational apps that Cognitive Kid have to offer are worth the download. With all the information that is shared however, we would love to see in a future update the incorporation of speech bubble that highlight as each character reads. With this differentiation, Ansel and Clair’s Dinosaur Adventure scientific application will be able to support all learning styles along their travels. If you would like to learn more about Cognitive Kid, please visit their website here. To start digging on your first archeological adventure, simply click here to download Ansel and Clair Cretaceous Dinosaurs to your iTunes library for $1.99 today! This review will be featured on Fun Educational Apps site along with many other detailed reviews. Are you a computer geek that loves programming or are you a classroom teacher instructing on such skills as angles, measurement and two dimensional geometry? If you answered yes to either these, then you have come to the right educational app review. 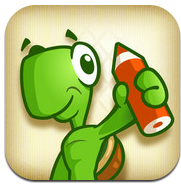 We are no stranger to educational app developers, Next is Great and we are pleased to add to our collection of reviews their latest addition, Move the Turtle. Regardless of which mathematical program your school district is using, we are quite certain that it is a program that builds understanding over a period of time. This understanding comes as informal and formal exposure while also integrating direction instruction. Move the Turtle is a mathematical app for students in their early to late elementary years. Recently it was featured in the App Store in the New and Noteworthy for Education. It is compatible for all Apple devices running iOS 4.2 or later. As your child(ren) works alongside an adult or independently with a ruler, various directions and a pencil, they will soon become a coding guru. With many school districts moving towards the Common Core State Standards and implementing mobile devices, the purchasing of educational apps is certainly under debate. When educational apps come at a cost, both educators and parents want to feel confident that their child(ren) and/or students will be gaming for a reason. A purchased app needs to not only engage the user, but it also needs to introduce, reinforce and/or challenge the target population. Technology is an essential tool that should be used strategically in any mathematics curriculum. Next is Great and Move the Turtle is certainly making this happen. Move the Turtle is based on the mathematical idea of Logo. Logo was created in 1967 by a Cambridge, Massachusetts firm. Logo gives students the opportunity to be introduced to basic programming or coding skills. Through a few simple step by step commands your “turtle cursor” will be able to draw geometric shapes and patterns, while also reinforcing angles. When looking at the standards for children as young as kindergarten they are expected to “identify and describe shapes, as well as to analyze, compare, create and compose shapes.” Over a student’s elementary years, this same curriculum expectation is expanded upon for a deeper understanding. With the ability to create what appears to be an unlimited number of accounts, users will be able to unlock a multitude of rewards as they play and learn within three chapters: Let’s Move, A Little Bit of Magic, and Professor Turtle. Chapters are broken into tasks which teaches and builds upon various commands such as: move, turn, pen, color, repeat, sound, position and conditions. It is important to note that there are no audio directions, just verbal/pictorial pop up menus which can support the user as moves are made. As you keep this in mind, this will determine if adult supervision will be necessary. Once it is time to “move the turtle”, the users screen will be divided into two areas. The first being the chalkboard building area which is equipped with a ruler along each X and Y axis. The left side is designated for reviewing and selecting specific commands in order to complete individual tasks. In order to put your commands/steps to the test, simply click the play button underneath your chalkboard. If tasks are considered incomplete, additional opportunities to succeed will be provided. When tasks are completed, young coders will earn 1-3 stars within each level. As rewards are earned, additional levels are revealed. As you progress through levels, tasks become more complicated, but build on previous tasks for further reinforcement. As most people know, turtles are very slow moving, but in this educational app, your turtle can move in three different ways: slow, medium and super fast. Come see what happens when these options are altered. Once commands are learned compose and save your own creations to your devices library. In addition, developers have also included a nice library of pre-made lessons. A note to the developers – is it possible to share newly made creations with other Move the Turtle followers? It would be greatly if your website had the option to upload and share projects in order to see how others are using this educational app. Overall, we love this educational app and plan to install it on our new iPads arriving this summer. For only $2.99, it is an educational app worth purchasing. Put your thinking skills to the test and become a coding geek. If you would like to learn more Next is Great, please visit their website here. To get your turtle moving today, simply click here to download Move the Turtle to your iTunes library. This review is also featured on Fun Educational Apps site along with many other detailed reviews. About a month ago Applicable2U was introduced to those at Sprout Labs. A development group interested in exposing elementary students to those things living in your own backyard. Earlier this year, they launched Plants HD which guides budding botanists to developing their understanding of the life cycle of a plant. As of late, Sprout Labs is once again making science happen at the palm of your hands with their recent launch of Butterfly HD. 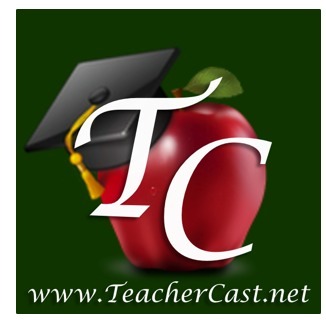 This educational app is designed for those with an iPad running iOS 4.3 or later. With a quality WIFI connection, see one of the most beautiful transformations of life through text, videos and photos. Does your life science unit need some improving? Are you a school district or classroom environment leading towards mobile devices for learning? Worried that you might not be meeting standards or benchmarks while integrating technology? When implementing those educational apps from Sprout Labs, these questions and concerns are all put to ease as it meets Common Core State Standards and the needs of different learning domains. As you “play to learn” with your mobile device, see one of the most beautiful day-flying insects, a butterfly, evolve from an egg – caterpillar – chrysalis – and finally a butterfly. Like Plants HD, upon entering this life science application, each stage of a butterflies life is a link to a wealth of information. To put your educator’s mind at ease, click the “scholar’s hat” in the upper right hand corner. This is an added feature with their recent launch, indicating how this educational app correlates to state science standards for those in Kindergarten to Grade 2. In addition, it also shares how the Common Core State Standards are met in Reading for Informational Text, Craft and Structure, Integration of Knowledge and Ideas, and Range of Reading and Level Text Complexity for K-5. Butterfly HD is a very professional looking, easy to navigate application. What Applicable2U loves about the applications from Sprout Labs is their ability to meet all learning styles. Children learn effectively when material is presented in a particular hierarchy or learning domain. This hierarchy is called Bloom’s Taxonomy. Bloom’s Taxonomy is much like the food chain in its design, a triangle. Each level of the triangle represents a level of thinking that as teachers we want our students to progress. The lowest three levels are: knowledge, comprehension, and application. While the highest three levels are: analysis, synthesis and evaluation. As your child reads, listens, answers and witnesses science through the application of Butterfly HD, this hierarchy of learning will be present. Some might compare Butterfly HD like a textbook and can be presented in a variety of formats: individually, in small or large groups. This will depend on the number of devices available and the needs of your students. Each stage of the life cycle is presented in a similar manner. On one side of the page is the informational content which shares a few lines of text or paragraphs at a time. Information that is to be introduced or reinforced can be read in two ways, by the reader themselves or narrated for them. If choosing to have it read, an underlining feature will appear line by line. To the left of the text are pictorial flashcards representing that stage of the butterflies life cycle for deeper connections and reinforcement. At the bottom of the page, developers have included a “Did You Know?” scrolling feature of WOW or interesting facts. You will be amazed at what your child(ren) will recall and share after they have explored. In addition to the scrolling flashcards, a digital camera of images is also included which gives an even more up close and personal connection to the life cycle of a butterfly. Taking it one step further, educational videos are also available. At the completion of each stage put your knowledge to the test by simply clicking the “pop quiz” button in the upper left hand corner. Questions have been organized based on Bloom’s Taxonomy of learning. With each correct answer, users are rewarded with a coin. As a certain amount of coins have been earned, a new level of learning is unlocked. Of course, as levels are unlocked, questions will become more challenging. While playing in the pop quiz mode, Applicable2U wondered how the results would be shared. By going through all stages of Bloom’s Taxonomy, users are given the number of correct questions out of a total. Depending on the results will determine of a follow up is necessary. A note to the developers – is it possible to design some kind of a progress report which indicates which level/question of Bloom’s Taxonomy the user struggled the most with? Overall, Applicable2U would give Butterfly HD two thumbs up! If you have an elementary student, then this educational app is applicable to you. It’s time to clear out the shelves of the old hardcover science textbooks and replace it with the newer mobile version. If you would like to learn more about Sprout Labs, please visit their website here. 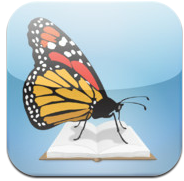 For $1.99, you too can alter your life science unit or enhance your child’s love of learning with Butterfly HD by simply clicking here. For the last few weeks, Applicable2U has taken a brief hiatus from educational app reviewing, but is now back in full swing as we spin things up with pin wheels and tornadoes. You might be thinking that our next review has something to do with science, in fact, it has to do with all curricular areas. Recently launched at the beginning of April was Compare a Twist by developers, App of Approval. Currently, it is designed only for your iPad device running iOS 4.2 or later. It is an educational app appropriate for a large population of learners and ability levels. Whether you are a student in kindergarten or an individual wrapping up their high school years, you are expected to understand the concept of comparing and contrasting. Come reinforce these essential skills when your iPad device is connected to a large screen projector, used individually or as a center activity. Initially, Compare a Twist is installed with 5 lessons, ranging from Art to Social Studies. Creative twists or lessons can be imported or added to devices making your experience of comparing and contrasting a challenge with each return visit. No two devices equipped with Compare a Twist necessarily looks the same. It’s time to personalize and share your learning environment to meet your specific classroom needs. Upon entering Compare a Twist, users will immediately notice its simple, but very effective design. Game building and play occurs at your finger tips. Whether you are learning in a large or small group, your main objective is to drag and drop items to its correct pin wheel or tornado cloud. Clouds are academically labeled as the similarity or the difference. Your pin wheel or tornado will blow in multiple options at the bottom. Learners, young and old are to tap choices and drop them into their correct cloud. If incorrect, items will bounce back to the bottom. However, if correct, users will earn a point as indicated in green. As your pin wheel or tornado stops blowing, users are given a success indicator. This indicator will appear as a bar graph stating the percentage correct and the percentage where help was needed. A note to the developers – is it your hope in a future update to expand upon this bar graph to share with educators or parents those areas needing support. By sharing this information, it can inform further instruction. Although there are no narrated words, an educator, home schooler or parent will intuitively know what to do. Simply choose between two icons, a cog wheel or a play button. The cog wheel icon will allow users to review, delete or edit default lessons. As mentioned earlier, there are currently only 5 lessons (Art, Mammals, Math, Plants or Animals, and Presidents of the United States). Users might think, why did I bother spending $2.99 to download. There are a number of reasons why your download was a good one. There are a number of conversations being had via social media networks and in schools as to why mobile devices should be implemented at the district level or within a classroom setting. There are so many questions going back and forth between teachers and administration. Is it truly worth the money? How can tablets make a difference in ones education? As most educators and parents know, there are a number of educational apps in the App Store that are truly effective, but how many allow you to basically make the app your own. Making Compare a Twist applicable to you is very easy and can be accomplished in two ways. Within in a matter of minutes, even seconds new lessons can be built and stored on your device. Simply click the “new” button where you will be asked to fill out a form. This basic form will ask for a lesson title, two categories, choices and their answer. Once saved, it can be edited as needed and is immediately accessible for game play. Did you forget to bring your iPad home? No worries!! New lessons can also be created via your Google account while using your desktop or laptop computer. From your Google account, open a new form. Forms or lessons need to have two categories and their appropriate answers in each cell. Once saved to your account, open Compare a Twist on your iPad device, click the cog wheel and log into your Google account. Documents created will appear as a list and can be imported for future game play. This is a great implementation of true integration of technology into ones curriculum. As Applicable2U reviewed the App of Approval website, we were pleased to see that they will be encouraging those using Compare a Twist to share their newly designed lessons via their website library. By sharing one’s educational wealth of knowledge as mobile devices are implemented is critical and App of Approval is beginning to make that happen. The potential that Compare a Twist has for your iPad device is very exciting and we look forward to future updates and how others are implementing and building in the classroom. We love the idea of not recreating the educational wheel. Education is about sharing best practices and resources without a cost. If you would like to learn more about App of Approval, please visit their website here. Spin around and reinforce a variety of essential academic skills as you play with Compare a Twist. It can be downloaded to your iTunes Library by simply clicking here. Has your son or daughter come home from school asking for help with their math homework? When you review it, do you sometimes feel slightly confused with the “new” approaches that your child is being taught. Concerned that you won’t be able to support your child during their nightly homework routine? All you can hear is your child saying, “I just don’t get this strategy of lattice multiplication.” While you are thinking to yourself, “whatever happened to the normal way of solving multiplication problems; lining up columns, recalling your multiplication number facts, carrying over the tens, and wrapping it up with addition.” With all these questions comes answers. Lattice multiplication is a method of multiplying large numbers using a grid. Although this lattice multiplication strategy may seem different from the traditional ways of teaching, it is in reality equivalent to solving long multiplication. When using this method it breaks the multiplication process into smaller steps, which some students find easier. Have no fear, approaching math in this manner should not cause you to call for a tutor. Your tutor can come in the palm of your hands as your child(ren) or student(s) learn and reinforce this mathematical skill with their mobile device. From the developers of many well known educational math apps, Esa Helttula has been improving upon her design of Lattice Multiplicaton. With a very simple design that is customizable for each mathematician, users will be pleased with the step by step visual approach and its ability to challenge students in a variety of ways. Those using the application on an iPad might find it helpful to rotate your device. By doing this, the orientation of the problem will change slightly. Depending on the users learning style, one direction may be more appealing than the other. For a teacher, the Lattice Multiplication app will intrigue many as it aligns with a number of mathematic programs currently in schools. There are several features that Applicable2U loves about this educational app. As my students or even my son games for reason, we enjoy the fact that there are no adds incorporated, that in order to be challenged an in-app purchase isn’t required, wrong answers are not penalized and that a user can take their time to grasp and comprehend the math concept being presented. Whether you are the teacher, a homeschooler, or the actual student integrating this application, it is important to establish your settings prior to exploration. Within the settings button, users can alter a variety of modes, however, when making these changes, be sure that you understand certain math vocabulary terms such as: multiplicand, multiplier, and operands. As you select new options, watch the problem design change in the background. For friends with color impairments, Esa Helttula has that covered, simply alter the screens background color to black, white or sepia. If users feel that the animation of step by step directions is moving too fast, simply change the animation speed. These academic accommodations alone has Applicable2U giving the Lattice Multiplication app a standing ovation. Lattice Multiplication will fit nicely in a multitude of ways at home and in school. Use this application for one to one instruction or use it in a whole group setting while your iPad device is connected to a projector. As you incorporate your device, the projector and this educational app, your math class will feel as though they have an interactive whiteboard now in their presence. Through our exploration, we noticed that the bank of questions or possible combination of numbers was endless and there did not appear to be the same problem twice. Although this was the case, users can create their own problems by selecting the “set” button. By double tapping inside each box, teachers, parents or students can build their own question set. This is a nice feature as the Lattice Multiplication app can now be customized and used in the classroom to go over homework problems done at home. In addition, to guide users, grids are pre-drawn, the multiplicand and multiplier are arranged around the grid for the players, and circled numbers are available when doing simple multiplication facts and adding. Through the use of highlighting, bigger problems won’t seem so intimidating as you solve smaller operations. Immediately, users are aware if they made an incorrect or correct tap of a number. Those correct will move into place within the grid, however, those incorrect answers will simply sit at the bottom of the page, indicating an alternate solution is to be picked. As the grid is filled inside, users will move from solving multiplication problems to solving simple addition problems. When adding multiple numbers, it is important for late elementary players to use such strategies as finding combinations of 10. At the completion of the problem, those numbers around the left side and bottom of the grid will magically appear as a completed number sentence. A note to the developers – was there a particular reason that commas were left out? Academically, Applicable2U would love to see a comma incorporated in the final solution. This will reinforce place value and the ability to read large numbers. Lattice Multiplication may seem foreign to many, but after practicing this approach on your mobile device, math will become a great deal easier. If math is a struggle for your child(ren) or student(s), then why not clear up those mathematical frustrations by downloading Lattice Multiplication to your Apple device. Does your elementary student have other areas of math concern, then you will want to visit Esa Helttula’s website here as she has 15 additional math applications in the Apple Store that will provide your child a number of “a ha” moments. You will not regret having paid $3.99 for Lattice Multiplication, it’s a lot cheaper than those expensive tutors. To begin downloading it today simply click here to access it in your iTunes library.